Complete guide to the 6 best rooftop bars in Rio de Janeiro in 2019. 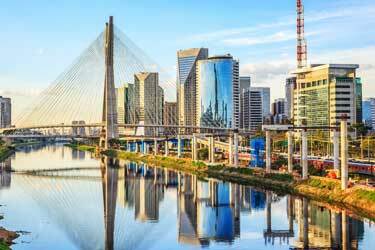 So, which is the best rooftop bar in Rio de Janeiro? Find out everything you need to know about each roof terrace. Opening hours, dress codes, pics, maps and much more. 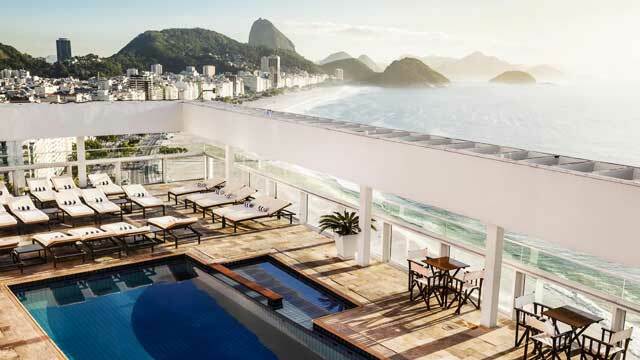 Find rooftops in Rio with breathtaking ocean, city and beach views. Rio is one of few cities in the world that can offer all these things in the same view. 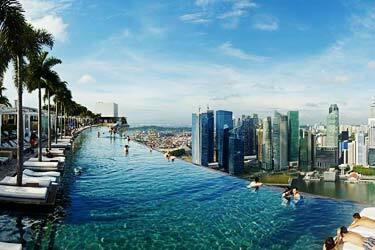 There are also some luxurious rooftop swimming pools here. 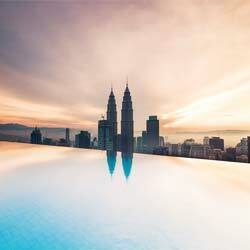 Make sure to book your stay at any of these hotels, if you want the most out of your visit. Look down and find the Rio rooftop bar best suited for you. Or use the Rio de Janeiro rooftop map in the bottom right corner. 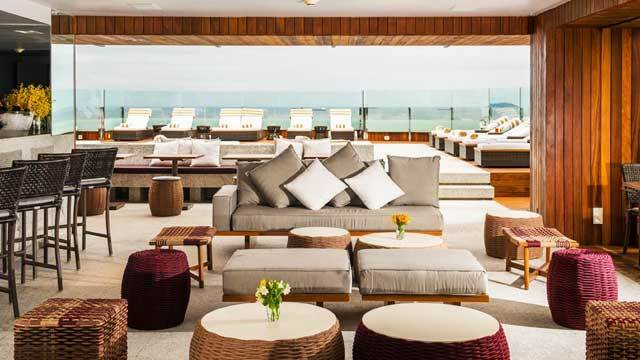 Perched on top of the luxurious Sofitel Ipanema, 23 Ocean Lounge comes wtigh 23rd floor views that are breathtaking. The ocean, the beach and what feels like all of Rio is on display. The rooftop is bright and modern in decor and has seating both inside and out by the rooftop pool. Open from early morning til midnight, the rooftop bar serves fresh international cuisine as both lunch and dinner along with fantastic cocktails, made by Renato Tavares, crowned as the third best bartender in Brazil. 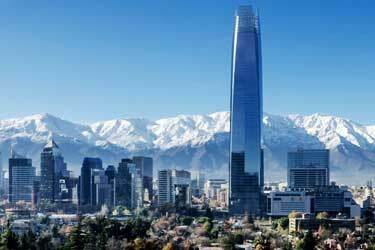 Ranked as one of the best rooftop bars in the world. 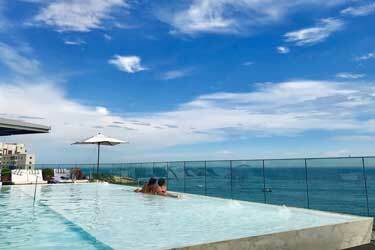 Located on the 8th floor of the fantastic Hotel Fasano, and up here you get a magical view of the Ipanema beach, Rio's skyline, the Two Brothers mountain peaks and the sea. From the rooftop bar you can order refreshing drinks, especially a range of fantastic juices, along with tasty food. Very luxurious in interior, with comfy daybeds and lounge sofas and a large and fantastic rooftop infinity pool in the middle. 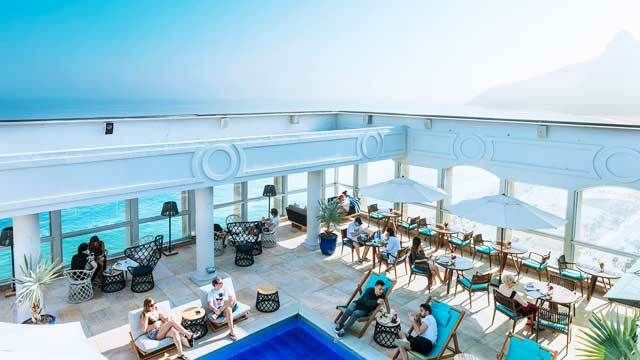 This comfy and relaxing terrace bar in Rio de Janeiro is located on the roof of the Porto Bay Hotel, with a spectacular panoramic view of Copacabana and the ocean. Dressed in natural colors and fabrics, Bossa Lounge is filled with comfy lounge sofas and has a very stylish bar. While the lounge part has a bit covered feel, it blends together with the open-air pool terrace, complete with sun loungers and a lovely rooftop pool. Enjoy relaxing vibes and the bossa nova music echoing through the speakers. 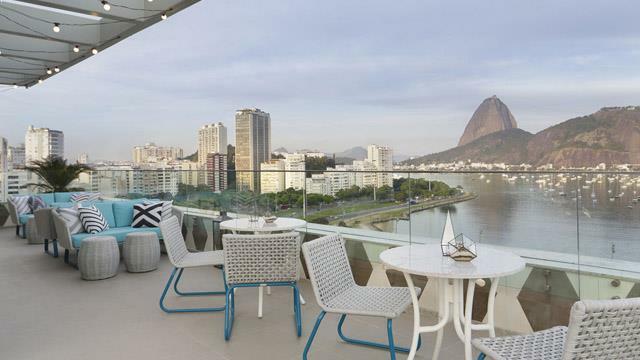 From this two-level roof terrace you get an absolutely magical view of Copacabana, the sea and the city skyline. One of the best views to get in Rio de Janeiro, extra fantastic just around sunset. 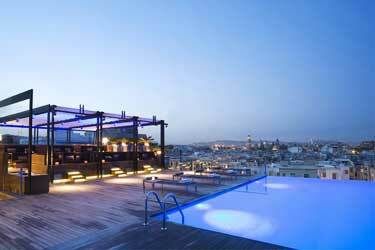 Equipped with a fantastic rooftop pool, the terrace works as a pool lounge for hotel guests during daytime. But after 7pm The Deck Bar opens up to all, and is a perfect haven after a full day among the crowds on Copacabana or for pre dinner drinks to get the night started. Chill on weekdays, more vibrant with live DJ on weekends. 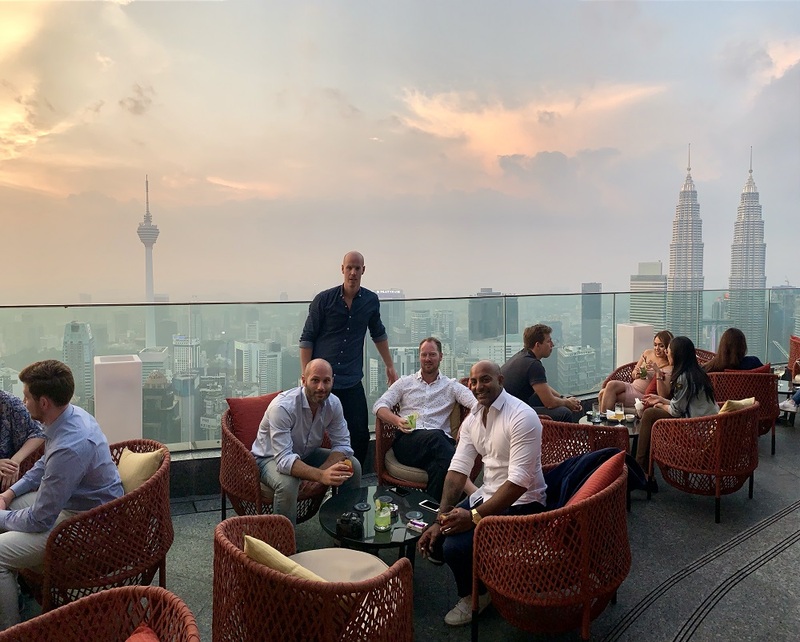 The contemporary and stylish Yoo2 Hotel comes with an equally trendy rooftop terrace, with a slightly different view compared to most other rooftop bars in the city. Located in front of Botafogo Beach, here you get a beautiful view of Sugar Loaf Mountain and Jesus statue, but also out over the boats in Guanabara Bay. The rooftop terrace has a modern and chic interior, with comfortable lounge sofas, trendy high stools and a beautiful bar. From the rooftop bar you can choose from a large selection of Yoo2 specialty cocktails, made by mixologist Roger Bastos. 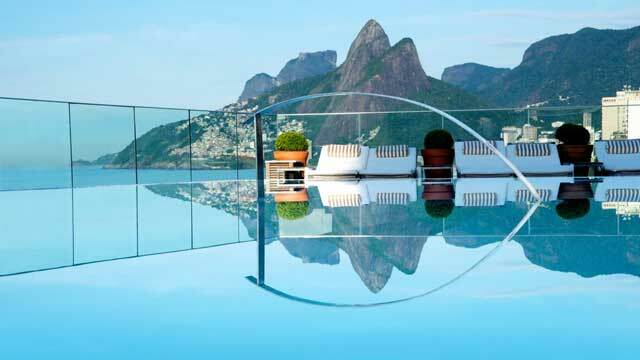 On top of the Rio Othon Palace you find both a superb rooftop pool with a magical view and sunset along with a restaurant and rooftop bar called SkyLab. While the rooftop pool for hotel guests only, SkyLab is open to all and offers (mainly) seating inside, but also some tables out on the open-air terrace. Situated at the edge of Copacabana, SkyLab offers á la carte service of cutting-edge French flavours and Brazilian favorites, while the SkyLab Bar has a large drink menu with both classic cocktails and a very impressive wine list. Discover the biggest collection of Rio de Janeiro activities, guided tours and skip-the-line tickets. Anything you want you'll find right here. Which are the best rooftops in Rio de Janeiro? This complete guide will help you find the best rooftop bars in Rio de Janeiro. The climate in Rio is tropical, which means that the average temperature is between 25-30 degrees celsius all year round. This contributes to that the rooftop bars in Rio de Janeiro can be open all year. Many of the terrace bars in Rio de Janeiro are magnificent, luxurious and with absolutely stunning views over the city and the sea. 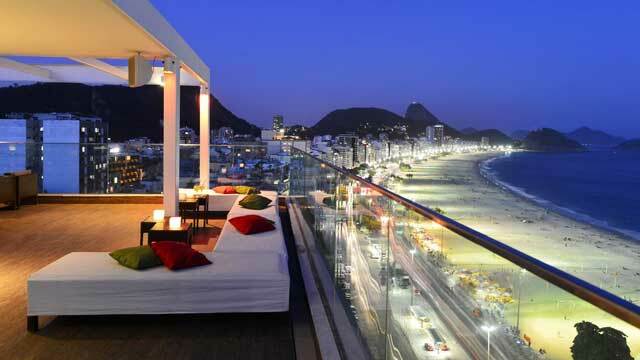 The typical Rio rooftop bar is located near the beach and with spectacular views over both the city and sea. When searching for rooftop bars in Rio de Janeiro, make sure to look at this page to find the best ones. Rio de Janeiro is Brazil's second largest city, after Sao Paulo. 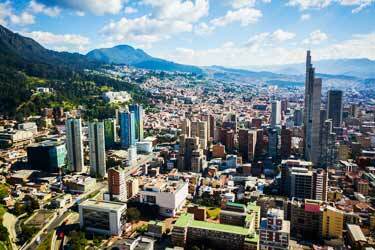 The city is situated on the southeastern coast at the Atlantic Ocean. Many suggest that Rio is one of the most beautiful cities in the world because of the surrounding mountains, the rainforest and the sea. 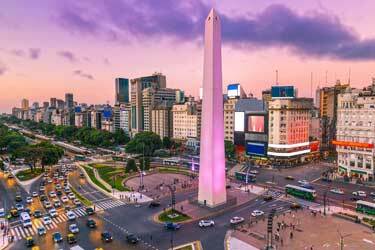 What the city is most famous for, however, is the carnival that takes place here once every year. Rio gathers party people from all over the world, dressing up and partying all day long. Copacabana is the city´s most famous beach with millions of visitors each year.